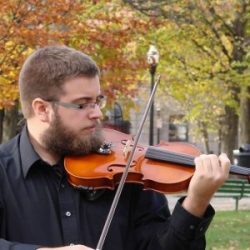 Aaron Pettengill is one of the most sought-after freelance violinists in Northern New England. He attended the University of Southern Maine and was concertmaster of the Southern Maine Symphony Orchestra. Among his honors are the Friends of the Kotzschmar Organ Scholarship, a performance as the Featured Young Artist at the White Mountain Bach Festival, and performances at USM both in the Honors recital and as a winner of the Concerto Competition. Currently, Pettengill teaches and performs all over the state of Maine. He’s a member of the Bangor Symphony Orchestra, and has performed with many other professional groups, including the Maine Music Society, Maine State Music Theater, Portland Ballet, and Opera Maine. He has been teaching private lessons for nearly 10 years; he currently works at Echo Management in Conway as a software engineer, and teaches at Mountain Top.